This produ t is safe and i totally love it. I use this product every day and its amazing. This combo is really nice and convenient! It has a base to click into and i found that a lot of the bases are usable. Its so easy to unclick baby seat from vehicle and putting it into the easily unfolded stroller. The stroller is easy to move about is not the heaviest and I'm sure not the lightest of them. 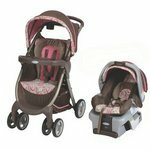 Once three baby is old enough to sit this is perfect for strolls also. We still use ours on outings and my son is 3! It's worth buying because you are going to want to use this for your LO for a few years. 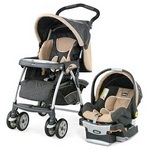 Its super safe and has buckles to keep them safely sitting. Fantastic stroller combo! I would not recommend this stroller. Consider buying other alternatives. Its difficult to fold and unfold if you are going alone with the lil one. And the infant seat is very bulky and very uncomfortable. I love this strolled & so does my 6 month old son. It's very easy to take with us to the grocery and put to the park without for a long walk. I have noticed the tires don't hold up very well after being on tons of walks in the past 6 months and I was really hoping this stroller would last atleast 3-4 years. I don't jnow about that now. Graco is amazing coming up with this stroller. It s so easy to setup and lightweight. 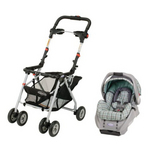 The baby seat just clicks on the stroller and there you have your travel partner. It made life easier for me as a first time parent and for my baby to be in comfort. So happy I got this! I don't even remember how I got my first one given to me but it made my life so much easier! I went and visited my friend yearsssss ago, when she just had her baby and was so surprised at how simple and easy it was so when I had my first, it was definitely an add to my baby shower list. I had an Mitsubishi Eclipse when I had my first and the stroller fit perfectly in my trunk and the car seat fit fine in the back seat, I was so amazed at how easy it was to just flip out and use, with being a first time mom then, I was so worried about everything and had to do everything right, by the time I had my second child, I still had the same stroller, same seat(my girls are only 14 months apart) I got used to flipping it open one handed and still loved it. By the time my third came, my first son, I wanted to get a boyish one and again, went with the Graco Travel and haven't regretted it yet, even though I didn't think I would. Definitely recommend! I got this as a shower gift, and it has definitely held up to the task of carrying around my youngest! This includes road trips and family visits out of state, so it is easy to pack up and fit in the trunk without leaving myself with no breathing room to bring anything else.